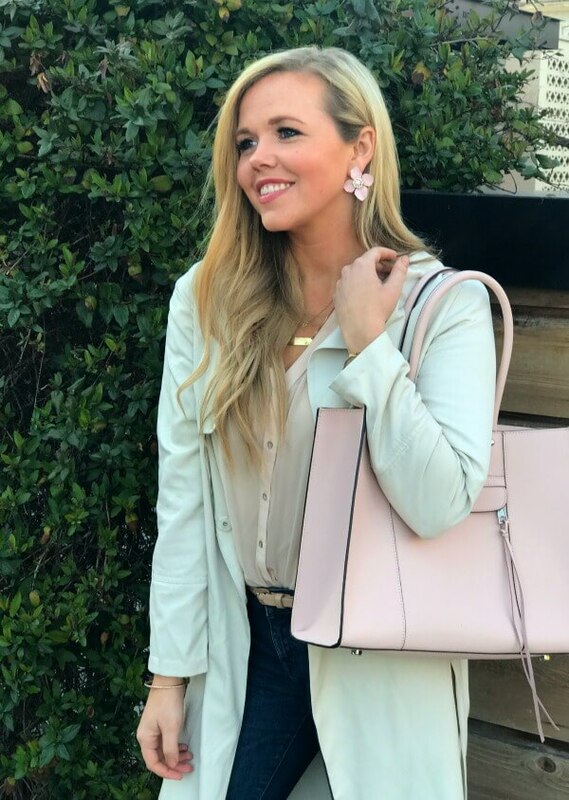 Good morning…I hope everyone is having a great Tuesday and thanks for stopping by today’s Trend Spin Linkup with Walking In Memphis In High Heels, Pearls & Twirls and myself! Today’s trend is FUN PRINTS! Bloggers : All bloggers will be able to submit their post links via the inlinkz widget below every Tuesday at 12:00am CST with their take on our trend of the week. This will allow bloggers to show off their personal style, find new followers and meet some great fashionistas! You will also have the chance to be featured on our blogs the following Tuesday (if you make sure to link back to Laura and my blog) ! So grab the button and link up. 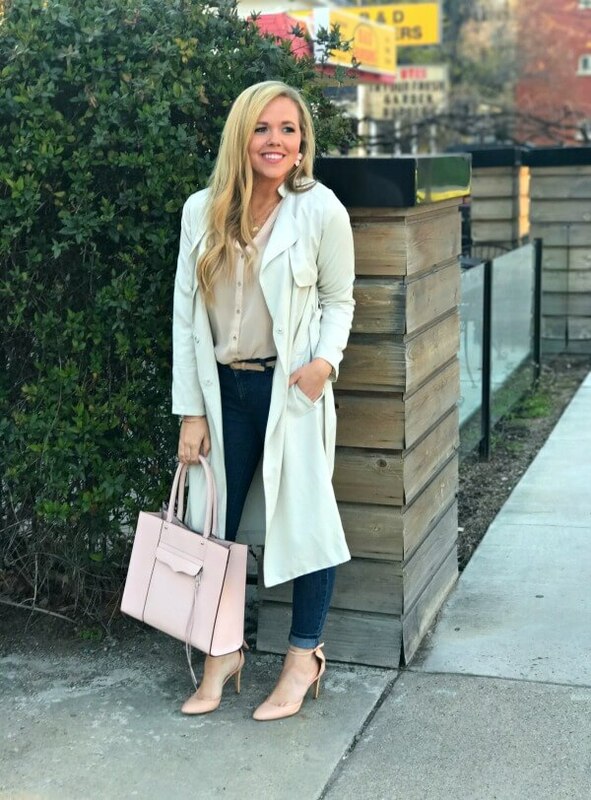 = ) For all bloggers we simply ask that you please follow your hosts – Walking in Memphis in High Heels, The Fashion Canvas and our guest host Pearls & Twirls and provide a link to the Trend Spin Link-up in your post or add the button below to your blog. Don’t forget to stop by everyone’s blogs to see how they wore the trend today. Leave a comment on my blog, and also on at least 5 other blogs! 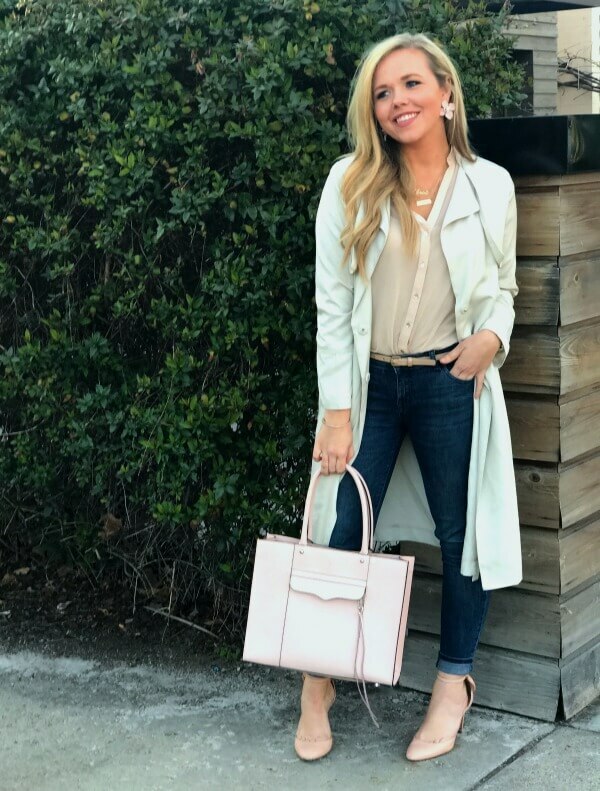 Good morning…I hope everyone is having a great Tuesday and thanks for stopping by today’s Trend Spin Linkup with Walking In Memphis In High Heels, It’s Julien and myself! 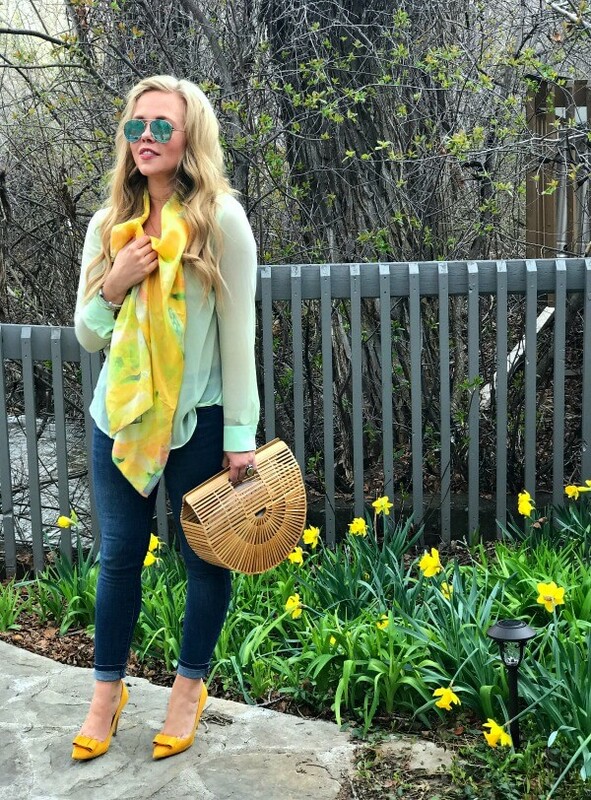 Here are our featured bloggers from last weeks SPRING BAGS trend spin linkup! Today’s trend is LACE-UP SHOES! Who doesn’t love this continuing trend in shoewear? Plus it is a great transition item that can take you from Spring…all the way to fall! 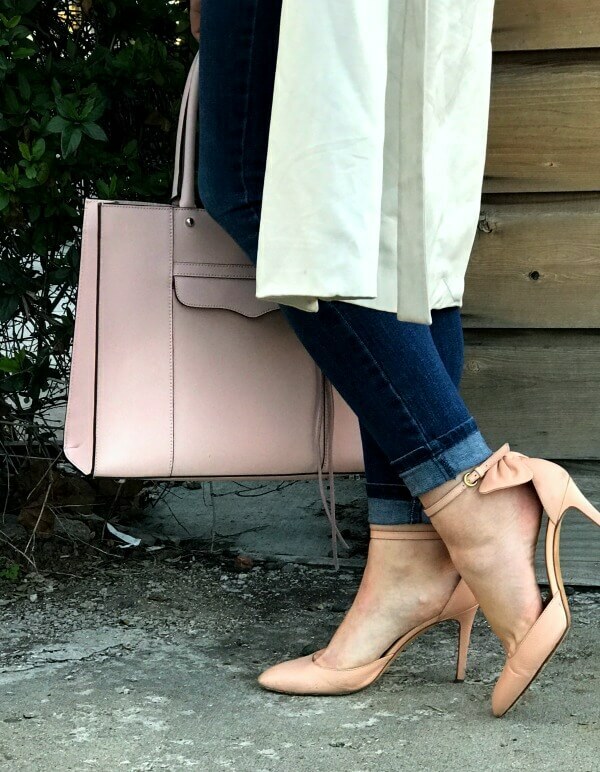 These pink Just Fab shoes have been a constant go-to for me (check the link above for the black version, definitely think I need!). They are a good alternative to a traditional lace-up shoe because they are pre-laced and actually have a zipper on the back, making them simple and easy. Next week’s trend is FUN PRINTS! I think that prints are a great way to throw some character into an outfit. I love floral, stripes, polka dots, gingham, cheetah…you name it and I will wear it! I am very excited to show you a new accessory I got from Narwicz Design. 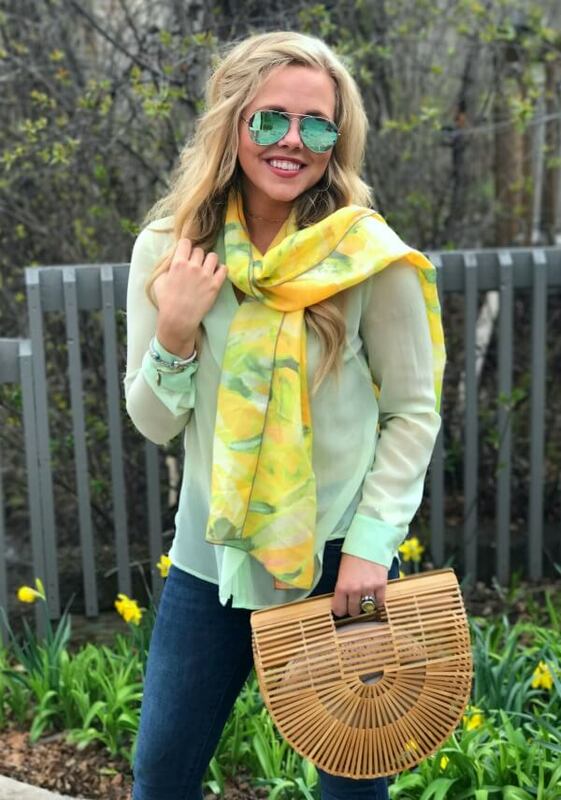 They are beautiful hand-printed silk scarves and add the best pop or color to my outfit! Make sure to tune back in next week. Bloggers : All bloggers will be able to submit their post links via the inlinkz widget below every Tuesday at 12:00am CST with their take on our trend of the week. This will allow bloggers to show off their personal style, find new followers and meet some great fashionistas! You will also have the chance to be featured on our blogs the following Tuesday (if you make sure to link back to Laura and my blog) ! So grab the button and link up. 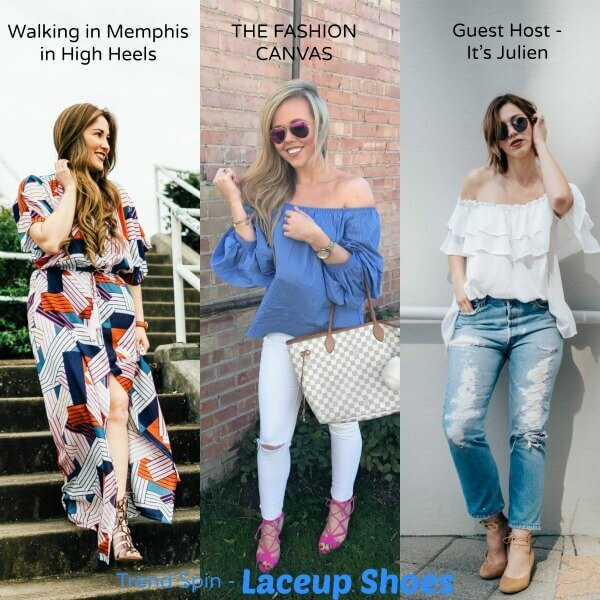 = ) For all bloggers we simply ask that you please follow your hosts – Walking in Memphis in High Heels, The Fashion Canvas and our guest host It’s Julien and provide a link to the Trend Spin Link-up in your post or add the button below to your blog. Don’t forget to stop by everyone’s blogs to see how they wore the trend today. Leave a comment on my blog, and also on at least 5 other blogs! 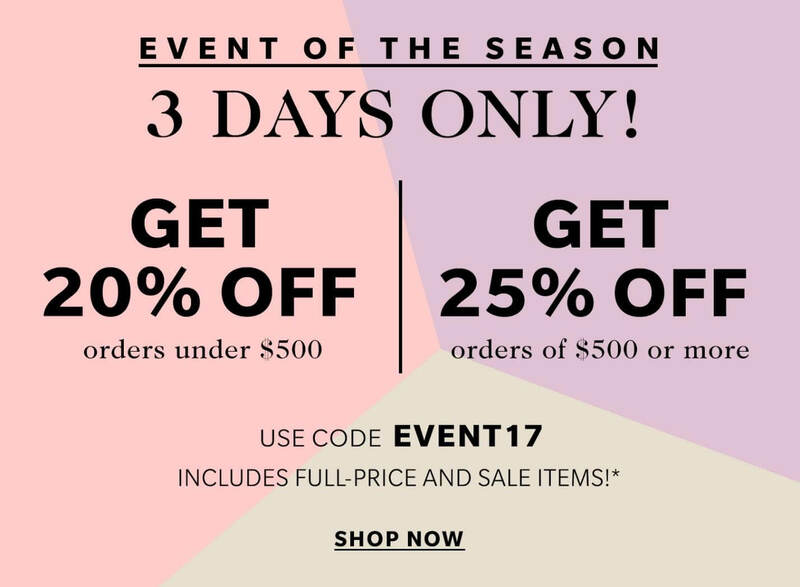 Shopbop – Event of the Season Sale! Below I have linked some of my favorite pieces! I already ordered THIS amazing off the shoulder dress, these TASSEL earrings, and THIS darling beach bag all for my trip next week. For more finds, you can view the entire Shopbop website HERE. The sale has also been EXTENDED :), so make sure to stop by the sale before it ends at the end of the day Sunday, April 16th! 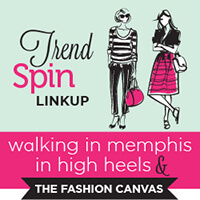 Good morning…I hope everyone is having a great Tuesday and thanks for stopping by today’s Trend Spin Linkup with Walking In Memphis In High Heels, Alicia Tenise and myself! 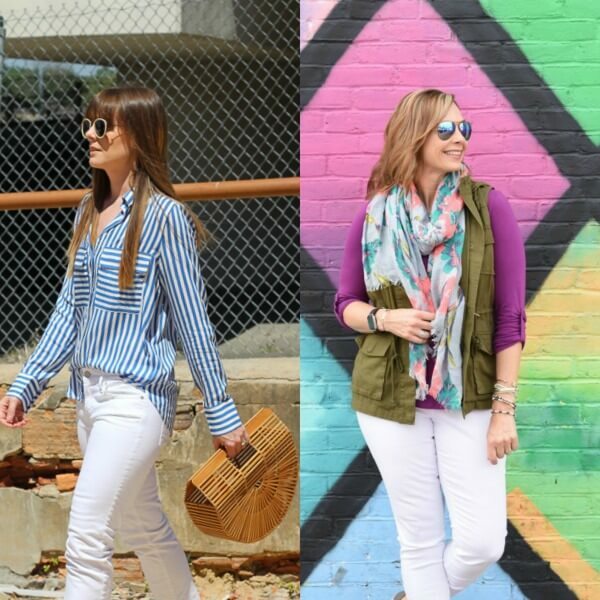 Here are our featured bloggers from last weeks FAVORITE SUNNIES trend spin linkup! Today’s trend is SPRING BAGS! The weather is definitely feeling like Spring. The rain is coming down, the flowers are starting to bloom, and people are starting to dress all things Spring. 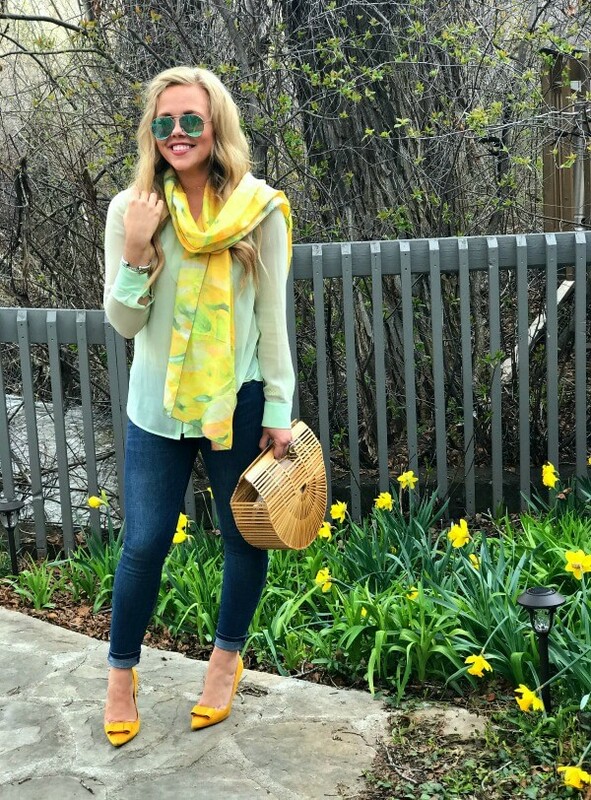 This week, the trend is all about Spring bags, so make sure to show your pastels, clutches or anything else you are wearing this season. Next week’s trend is LACEUP SHOES! Bloggers : All bloggers will be able to submit their post links via the inlinkz widget below every Tuesday at 12:00am CST with their take on our trend of the week. This will allow bloggers to show off their personal style, find new followers and meet some great fashionistas! You will also have the chance to be featured on our blogs the following Tuesday (if you make sure to link back to Laura and my blog) ! So grab the button and link up. 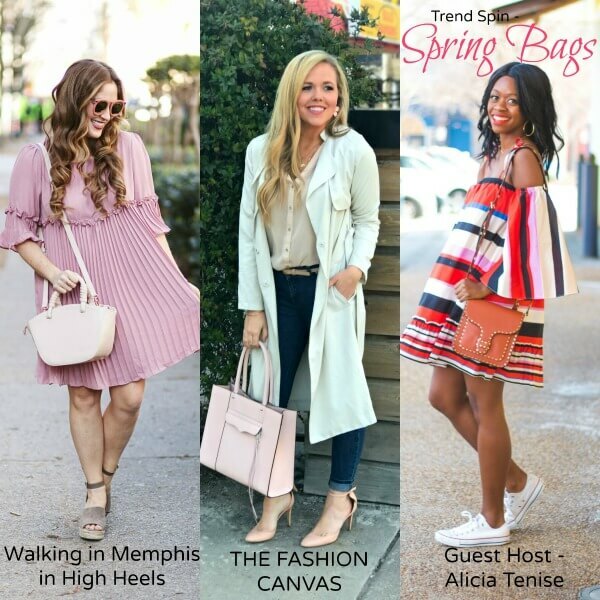 = ) For all bloggers we simply ask that you please follow your hosts – Walking in Memphis in High Heels, The Fashion Canvas and our guest host Alicia Tenise and provide a link to the Trend Spin Link-up in your post or add the button below to your blog. Don’t forget to stop by everyone’s blogs to see how they wore the trend today. Leave a comment on my blog, and also on at least 5 other blogs!